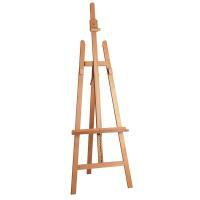 A-Frame easels (sometimes called Lyre easels) are triangular in shape with two legs at the front and a third supporting leg at the back. As the name suggests, when viewed straight on, they look look like a letter A. 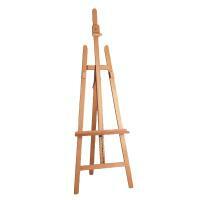 The back leg on an A-frame easel can be folded in allowing the easel to be stored flat, or leaned against a wall to take up less space while being stored. 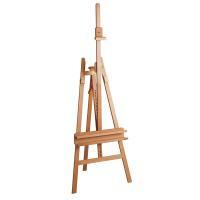 A-frame easels are best for people who want to work on a small to medium scale, but have limeted space in which to work and store the easel. 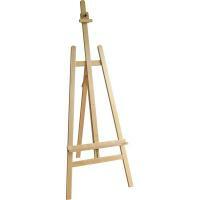 A-frame easels are also great for displaying finished paintings, signs etc and are often seen in shops or at events being used as display easels.